White Paper Abstract: With an aging population that is living longer  an estimated 10,000 baby boomers become eligible for Medicare each day  and a shortage of specialists trained for the field, palliative care is no longer taking a back seat to more traditional healthcare. 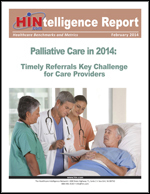 Nearly three-fourths (70 percent) of 223 respondents to the Healthcare Intelligence Network's first annual Palliative Care survey in February 2014 said they have a palliative care program in place, and of those that don't, more than half (55 percent) said they planned to launch a program within 12 months. The definition of palliative care, too, has evolved: it is no longer intended just for the terminally ill (80 percent), but is also beginning to encompass those with serious illness (74 percent) and multiple chronic illnesses (64 percent) who can still benefit from quality of care and life. Pulling such a program together requires a mixed bag approach  everyone from oncologists to pharmacists to theologians are considered part of the palliative care team that provides everything from chemotherapy to pain symptom management to spiritual support for both patients and their families and caregivers. Download this HINtelligence report for more data on palliative care, including details on palliative care program components, results and ROI; successful work flows, processes and tools, and much more.